Winchester has an advantage over many other gun safe companies. One of the benefits is they are one the oldest in the industry. The company has stood for quality, integrity, and reliability since 1866. Winchester was the first company in the industry to have their products listed by UL in the RSC category. This is because all of their safes have been tested and are burglar proof. The Bandit Series is the only safe by Winchester that hasn’t been tested. Most gun safes on the market are fireproof in temperatures up to 1200 degrees, but many of Winchesters safes are fireproof in temperatures up to 1400 degrees. The company has a replacement guarantee that covers free replacement safe, free locksmith service to unlock the safe, and free curbside delivery. They will replace the safe if it is damaged by a burglar or is destroyed in a fire. The safe has to be the same model or a comparable model. All safes come with a two-year warranty on the lock and a limited lifetime warranty on the safe itself. Let’s check the most popular Winchester gun safe reviews by their remarkable features. The Winchester Ranger Deluxe is fireproof up to an hour at temperatures up to 1400 degrees. It is equipped with three layers of fireboard in the door and two layers in the body. The door has a seal that will expand in the event there is a fire. The expandable seal gives your valuables more protection from fire, accounting for a “built-in” feature which would otherwise be found through the purchase of gun safe door organizers. The lock has a hard plate so it cannot be drilled out by an intruder. The safe comes with the warranty like all Winchester products. You can choose between a mechanical lock or an electronic lock. The way the safe is designed can prevent it from being damaged in a flood. The safe weighs in at 560 pounds so a crook will not attempt to move the safe. It is impossible for someone to drill into the safe to gain access. The Ranger Deluxe can withstand high temperatures, but it can only withstand them for a short period. Other safes can withstand lower temperatures for a longer period. 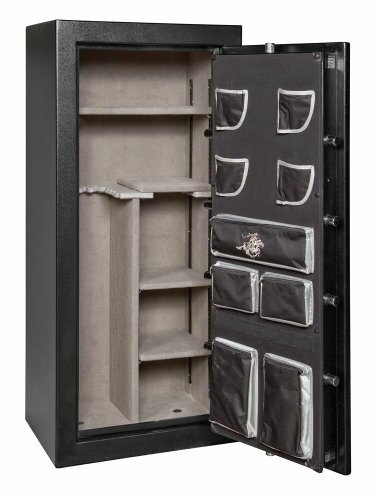 This safe is smaller than other gun safes that hold up to 24 guns. You should consider buying a bigger safe if you want to store more than your guns. The batteries for the keypad go dead quick. I would recommend keeping extra batteries for the safe. This safe is not much different from the Winchester Deluxe 24 Gun Safe. It has an electronic lock that many people would enjoy since a safe with an electronic lock can usually be accessed quicker. It is also equipped with a door panel organizer, unlike many other safes. You would normally have to purchase the organizer separately. Compared to other brands with the same features the Winchester Ranger Deluxe 19 Gun Safe has an incredible price. The safe is fireproof. It also comes with Winchesters famous warranty and guarantee. Consider extending warranty as well. Door panel organizer so you can keep the contents of the safe organized. The electronic lock is under a warranty for two years, and you can extend the guarantee to nine years for seventy-five dollars which are about the same price as a lock. There is an alert that will warn you when the battery gets weak. The safe is equipped with shelves in the event that you have small valuables you want to store since the door panel organizer has a limited amount of space. The batteries for the keypad die quickly. I would recommend you keeping extra batteries. Some of the reviewers had mentioned that the safe was damaged when they received it. If this happens, Winchester will fix the safe hassle free. It is only fireproof for up to one hour. I advise you not to store ammunition in the safe. If you want a safe, that is fireproof for a longer length of time you should check other brands in our list for fireproof gun safes reviews. See our list for the best Gun Safes Under 1000! Most Winchester gun safes have many features that are alike. These two gun safes have very few characteristics that are different. They all come with same warranties and guarantees. The two safes I listed above are the highest rated safes by Winchester. You are sure to find all the features you want in one of them. 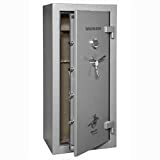 Both safes come from a well-respected company and the Winchester gun safe reviews will make you realize that the business puts out some of the best quality products in the industry. I recommend you looking into a Winchester safe if you want good quality that is dependable. DO not buy a Winchester safe to protect your valuables: I just wanted to let you know that I am personally sad about the lack of support Winchester Safe Co. has offered my daughter and son in law at the time of their recent house fire (May 19). They live in Madison, Virginia. They purchased a Winchester Safe in November 2016 (six months ago). They contacted customer service department within two days of their fire explaining that they could not get into the safe. After another couple of days, it was suggested by your Winchester CS representative that a new “key pad” would probably correct the problem and that one would be mailed out. then a Winchester locksmith was dispatched and today they were able to find their most prized possessions full of mold, mildew and dampness that could have ALL BEEN AVOIDED if Winchester CS had done their job at the first phone call. At a time of duress (losing three pets in the fire, losing most of their clothes, furniture and having to rebuild their home from the studs)…and in all other hardships that this couple has had to face, I want to say SHAME on Winchester for making this one of their worries. I do not see why THEIR homeowners insurance should have to replace and repair valuables that didn’t HAVE to be damaged by three weeks of waiting on mold to set in. I understand that a new safe has been offered to them. Seriously, I hope they do not accept that offer / clearly this product cannot protect valuables. My hope is that Winchester will refund their money (they have a receipt from Tractor Supply Co.) so that they can buy a better product (Liberty?). Lastly, thank goodness for an honest community. The safe has been in an unlocked / unsecured (walls demolished preparing for repair) home while waiting for the Winchester locksmith. Perhaps the safe is good quality. The customer service offered to this young couple was NOT good quality. Just beware. Thank you for your detailed explanation, Tracy! Bought on Dec 2016 and the lock warranty just expired. Tried 3 new batteries and beat on per customer service rep with no results. Just found out a locksmith that can open it will be a minimum of $325,00. AVOID WINCHESTER! If that can’t put on a lock that will last, you should avoid them!